When modeling ICC 105A tank cars, we only need to know that the “dome” on the tank top is really a housing for piping connections and valves. When closed, such a housing or bonnet is small and simple in appearance. As an illustration, the photo below is an ICC 105A ammonia car owned by California Dispatch Line. It is a builder photo from American Car & Foundry, courtesy of Ed Kaminski. The bonnet is painted white. The same size and design of car could be used for LPG (Liquified Petroleum Gas). I have shown in several places the photo below of the interior of such a bonnet; this is also an AC&F photo from Ed Kaminski. This is the aspect that relates to loading and unloading. You can see the four pipe connections and valve handles. Each connection has a small disc covering its opening to the outside of the bonnet. One is visible just under the grab iron. You can clearly see the three connected hoses here. The fourth outlet, if used, was often attached to a thermometer, but of course two outlets to the side were needed to permit unloading from either side. Another 1942 Vachon view, LC-USW3-10331-D, shows below a connected bonnet from the sunny side. The two liquid lines emerge from the sides of the bonnet lying along the long axis of the car, while the vapor line is the third line. It includes a pressure gauge. There are two reasons for a vapor line. One is that it prevents air from entering the cargo space, but the second and more important is that it is the means of pressurizing the car interior and forcing the liquid out through the liquid lines. Liquified gasses that are thermally saturated, like LPG, are difficult to pump as liquids because of a strong tendency to cavitate, so moving them by vapor pressure is simple and safe. Note that after liquid movement, vapor can be recovered and the car interior brought to the desired final pressure. 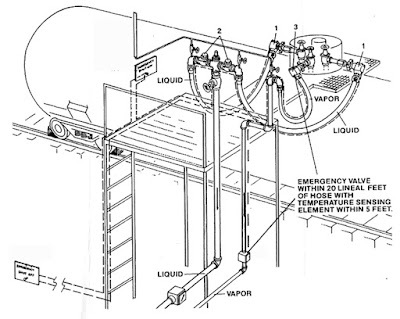 Shown below is a drawing of the hose connections (also included in the Modeler article), showing clearly the arrangements. 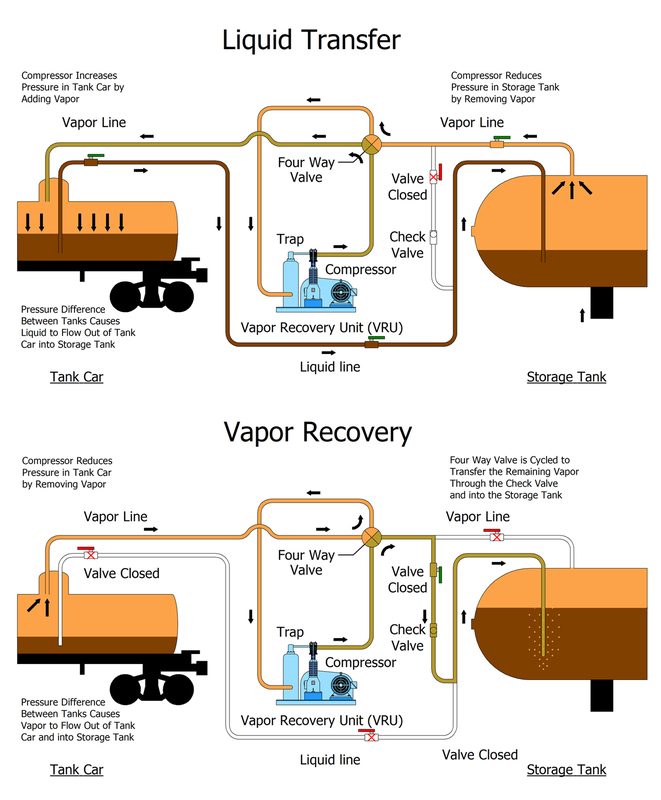 To summarize what this means for modelers who wish to represent unloading of high-pressure tank cars, a set of three hoses needs to be modeled. Moreover, it was common to color-code the piping for the liquid and vapor lines so that there would be no confusion. Though a variety of color codes can be seen in photos, the most common color for the liquid lines was red. This is shown in a Lloyd Keyser photo, taken at Green Bay, Wisconsin, of an LPG dealer facility. The counter-weighted drop-down walkway is a nice detail. Note that the two red liquid lines join right below the platform. With this background on how these tank cars were loaded and unloaded, a modeler can proceed with appropriate elements in the scene being modeled. The title refers to a series of books published by Speedwitch Media, Ted Culotta’s company, with the series title Focus on Freight Cars. These present an excellent collection of very high-quality photographs taken in the Los Angeles area in the late 1930s, reportedly by one or more persons planning to develop scale model railroad products. Accordingly, many of them emphasize details of the cars along with portrait views. Below is a list of the eight volumes published to date. The only ones that I know are out of stock are Volumes 3 and 4, and I understand both are going to be reprinted shortly. Further, a friend of mine recently was able to find copies of some of these volumes used, on the internet, so any not currently available from Speedwitch can be sought in that way. For more information or to purchase, you can visit Speedwitch at: http://speedwitchmedia.com/books-journals/ . 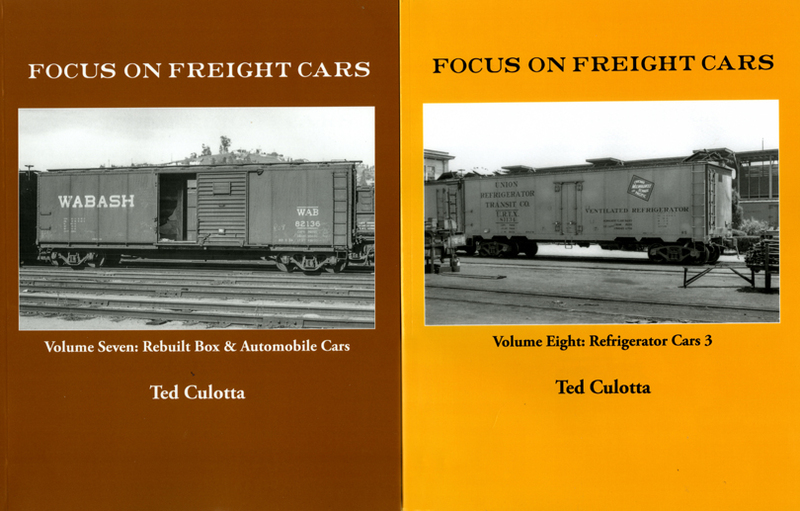 You will notice that there have been three volumes on refrigerator cars, and the forthcoming Volume 9 will be a second volume on single-sheathed box and automobile cars, following Volume 1. Most of these list for $42, though new ones (several more are planned) are often offered at an advantageous pre-publication price. It’s worth keeping an eye on the Speedwitch site to learn of new additions to the series. 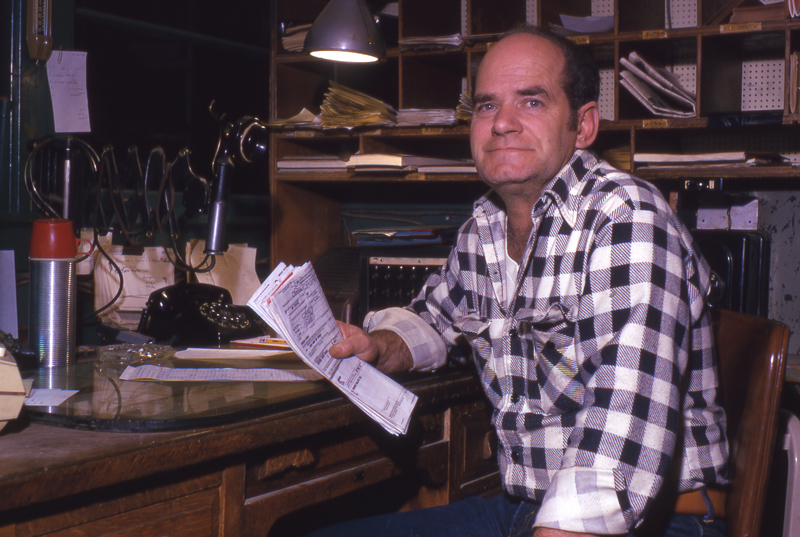 The first two volumes were written by Richard Hendrickson, and all the ones published subsequently are by Ted Culotta. Were Richard still alive, I strongly suspect he would be continuing as author, but Ted is doing the job in Richard’s absence. I don’t wish to present all of these publications, but want to show a few covers just as illustrations. Shown below are volumes 3 and 5. Following on to those volumes, as shown below were volumes 7 and 8. All these books are perfect bound, 8.5 x 11 inches in size, and contain 84 to 104 pages. These books are a marvelous resource for modelers of eras from the middle to late 1930s, until at least the end of the 1950s. You simply will not see better quality photos nor anywhere near this level of detail. 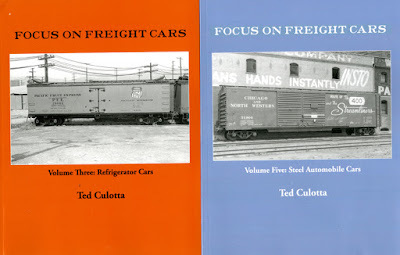 I highly recommend them to anyone interested in freight cars. Likely I need not even mention these titles to true aficionados, who will not only know of these books, but will own the full set, as I do. But for everyone else, do consider buying a volume or two and see what you think. In Part 1 of this series of blog posts, I introduced my project of building two tank car loading or unloading platforms, using as a starting point the Walthers kit for an “Oil Loading Platform,” their kit no. 3104. You can read that post at this link: http://modelingthesp.blogspot.com/2015/03/tank-car-loading-unloading-platforms.html .I simply divided the Walthers single platform into two platforms. In Part 2, I showed my assembled platforms before railings or piping had been added, other than the delivery piping to the platforms themselves, and I showed how I rearranged the kit railings to apply to my two platforms (see: http://modelingthesp.blogspot.com/2017/02/tank-car-loading-platforms-part-2.html ). 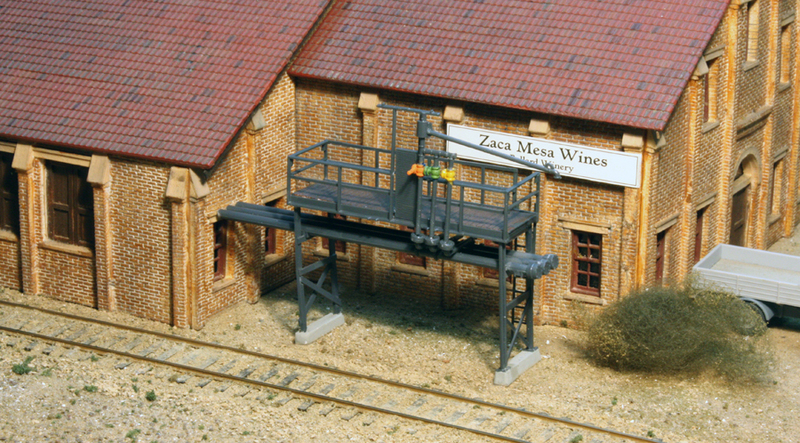 At the end of Part 2, I had one platform, the one to be used at my layout’s winery, lacking end railings, since those parts from the kit were to be applied to the second platform. Adding those end railings was pretty simple. I just added small support blocks of scale 4 x 4-inch styrene to the end posts, then attached crosspieces of scale 2 x 4-inch styrene strip. They can be seen in the photo below (they will of course be painted later). The access ladder hasn’t been added yet. 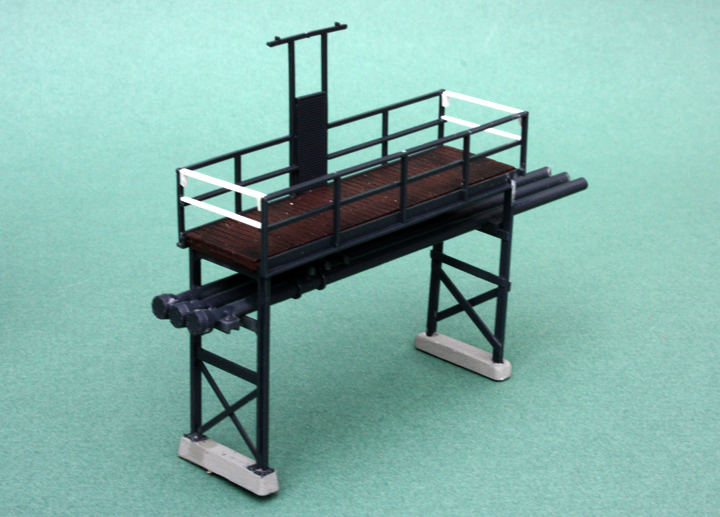 Meanwhile, the chemical company platform received the kit end railings. As was true in several steps in assembling this kit, the fit of parts was less reliable than in other Walthers kits I’ve assembled. I had to shim the posts at one end. Here you can see the shims in the white styrene. To add an access ladder to the winery platform, I first placed an additional post, using the scale 4 x 4-inch Slater’s styrene strip. Once glued and allowed to set very solid, this stabilizes the top and intermediate railings. The photo below shows the back side of the platform, relative to the track. Once this intermediate post was well set, I used a sprue nipper to cut the top and intermediate railings, and add a length of brass ladder stock. My next step was to add the loading pipes to the winery platform. It is common to color-code such piping, either the entire pipe or some part of each pipe. I have seen this kind of color coding done just at the valves, so chose to paint this piping that way. I used yellow and orange, plus green (Model Master “Zinc Chromate Green”). The delivery pipe was attached to the manifold outlet as though it had been swung parallel to the track. Finally, I needed to paint all the white styrene and the ladder to match the rest of the platform. I have found Tamiya “German Grey,” no. XF-63, to be an excellent match for the color of the plastic in which this kit is molded. Below is shown the completed platform in place at the winery. It was satisfying to get this platform finished, and it will make the “tank car spot” at the winery on my layout much more realistic. But the other platform, the chemical company one, has some additional complications. 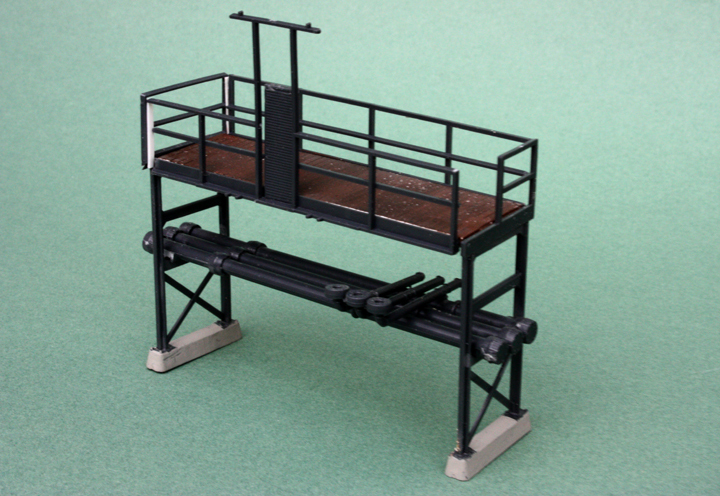 The winery platform is for loading cars (as the Walthers kit was intended to portray), but the chemical one is to be used for unloading cars, which leads to several differences. I will show its completion in one or perhaps two posts about that platform. In Part 1 (see: http://modelingthesp.blogspot.com/2015/03/tank-car-loading-unloading-platforms.html ), I described the needs I have for platforms to both load and unload tank cars at industries on my layout. My starting point is a Walthers kit, their no. 933-3104, which they call an “Oil Loading Platform.” Here is approximately what they envision it looking like (I say “approximately” because this is a photograph of the pre-production model, and there are numerous though minor differences between the model shown in this photo, and the parts provided in the kit). As I stated in Part 1, I am building two separate platforms with these parts, each of which has a loading/unloading position on one side, instead of the kit’s arrangement to load cars on both sides of the platform. 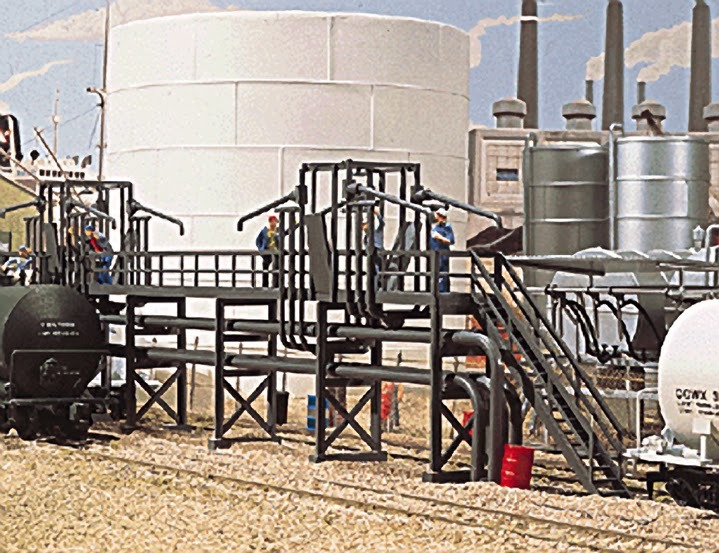 Here is a prototype view of a tank car loading being conducted from an elevated platform, a view I included in my Model Railroad Hobbyist article on building a model of a bulk oil dealer (March 2014 issue; all MRH issues can be downloaded free from their site, at: www.mrhmag.com ). 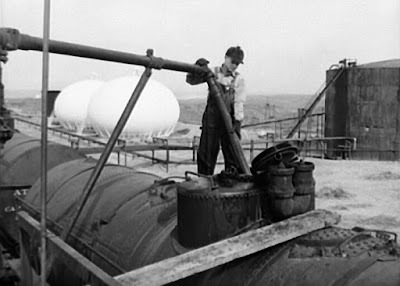 The photo was taken by John Vachon in November 1942, at the Phillips refinery in Borger, Texas; the image is from the Library of Congress, image no. LC-USW3-011638. The workman obviously has used the plank to cross over to the tank car top, but more modern platforms almost always provided a short bridge or walkway to step over the gap. If the pipe the workmen is holding in the photo above were arranged to pump out the car, this would also be what unloading could look like. Tank cars without bottom outlets (AAR Class TA) would necessarily be unloaded that way. As I showed in Part 1, I scratchbuilt an additional platform support for my second platform, since the kit only provides three supports. I also used a piece of Evergreen styrene strip, 0.125 x 0.188 inches cross section, to make the concrete base for the fourth support. 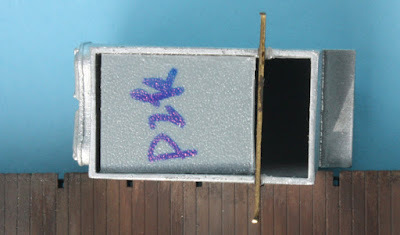 The first assembly step is to place the pipe runs so they connect the platform supports. This in turn required me to plan how I want my piping to be arranged for each platform. 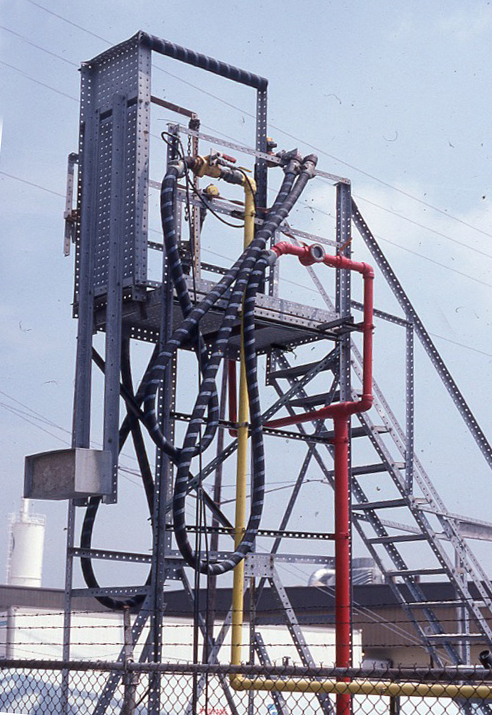 At the winery, piping can come out of the building wall to the platform; at the chemical plant, piping can come out of the ground. Luckily the kit provides ample pipe caps and unions so that piping can be configured in various ways. I did arrange the piping of my two platforms to suit each of my industries. With all supports attached to bases, and piping runs adjusted to my needs, the two platforms were assembled, following the kit directions, though I will have to say that, compared to other Walthers kits, the fit of the parts was not particularly good. I had already painted the scribed-styrene platform deck a seasoned wood color (Star Brand STR-11), so in the view below you can see the contrast in color. This is one of the platforms in progress. The next step in completing these two separate platforms is the addition of railings. Here again, because the kit is designed as a single platform, its one-piece side railings have to be separated into two sets of side railings. And since the kit has only a one pair of end railings, one of my separated platforms will have to have new end railings. The most important point to recognize about separating the railings is that there aren’t enough vertical posts. This means planning for the new end railings so that the parts separate correctly. I used the “walkway” part of the front railing from kit part no. 5 on one platform, and its plain part on the other one. Shown below is a photo at this point. The platform at right, with the longer piping, is the one for the winery. The photo of the platform at left above shows the “missing post,” which will be concealed by the kit end pieces. And of course, when installing the railings, don’t forget the drop-down walkway, which has to be inserted as the front railing is attached. That is in place in the platform on the right. After attaching the two parts of the divided kit part no. 5, shown above, I did the corresponding cut on part no. 4 and added the two sections to the two platforms, as you see below. In this photo, you can see the ‘missing” posts on the platform at right, while the winery platform at left has end posts on both railing segments. 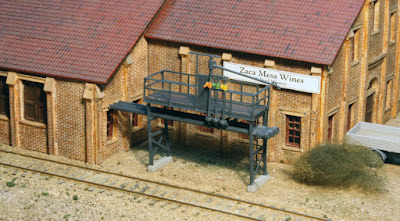 The next steps will be to add the missing pieces to complete the railings on the winery platform, and also add an access ladder to its back side. The kit stairway will be added to the other platform. Then comes piping. But those steps will be described in a future post. 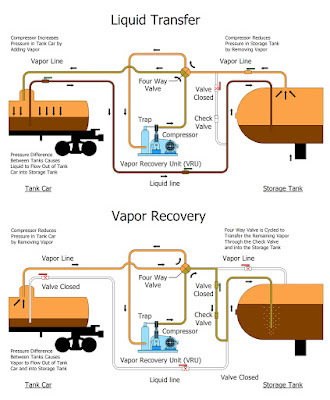 As is evident from the handout I posted to this blog a month or so ago, I gave a new talk at the Cocoa Beach “Prototype Rails” meeting on wine tank cars (see it at this link: http://modelingthesp.blogspot.com/2017/01/handout-for-wine-tank-cars.html ). One of the topics I spent some time discussing in that talk was the numerous tank cars in wine service which had been converted from their as-built single-compartment design, to three-compartment cars. 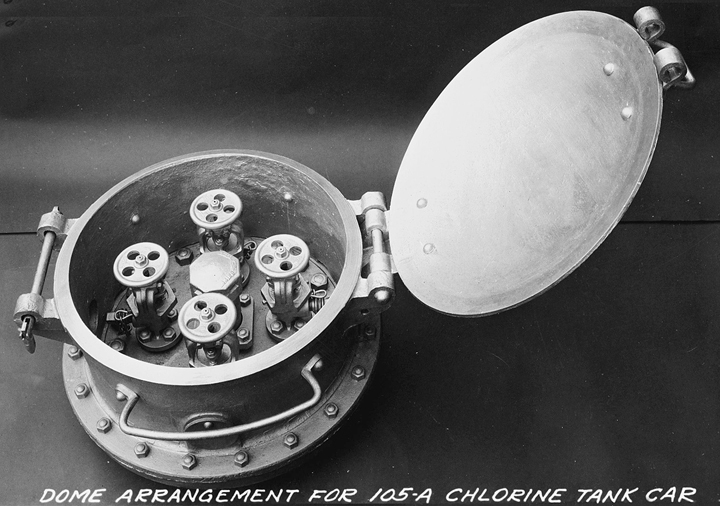 This was readily done by removing the tank heads (the curved end pieces of the tank), placing two pairs of similar bulkheads inside the tank to make three compartments, and then putting the end heads back on, along with an insulating jacket. Shown below is a sketch of the final car interior (based on a sketch by Richard Hendrickson). Note in this photo that the car has frangible-disk safety vents atop each dome, instead of safety valves. 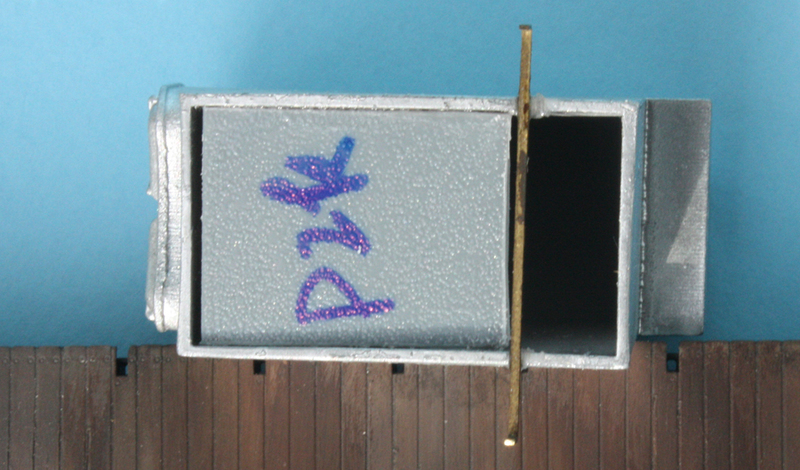 I discussed the use of these vents, and showed the correct model parts, in a prior post (you may read it at this link: http://modelingthesp.blogspot.com/2017/01/frangible-safety-vents-on-tank-cars.html ). The auxiliary domes also have flat tops made from steel plate. I wanted to try and model one of these cars. The first thing to do is to estimate the various dimensions of the car as you see it. This is relatively easy, because we know the wheels are 33 inches in diameter. Measuring a wheel then gives you a scale number to convert all other desired dimensions. When I did that with this particular car, it turns out to have a tank which is 34 feet long and 78 inches in diameter, a center dome which is 55 inches in diameter, and end domes which are 50 inches in diameter. These proportions could be used to model cars that would have different sizes than this car. 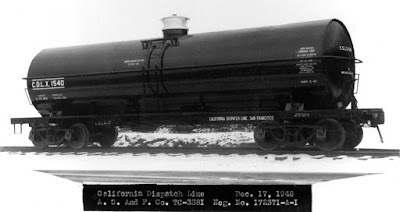 I know that this is a 6000-gallon car from looking it up in the Tank Car Capacities Tariff (for more on that essential document, see my post at: http://modelingthesp.blogspot.com/2016/12/the-tank-car-tariff.html ). Specifically, its three compartments are almost equal in size, at about 2000 gallons each (adding up to 6089 gallons). But cars of other sizes were also converted in the way shown in the prototype photo above. I decided to make a stand-in model of such a car. I began with the former Proto2000 insulated tank car, a 10,000-gallon car, more recently available from Walthers. This model represents an American Car & Foundry Type 21 tank car, and its tank diameter is 96 scale inches (about 1.1 actual inches). The dome has a diameter of 64 inches, or 0,734 actual inches. Choosing a smaller dome diameter, in accord with what you see in the prototype photo above, I chose to use Plastruct 5/8-inch tubing, which translates in HO scale to 54 inches. My first step was to grind the ends of the Plastruct tubing to match the 1-inch tank size, for which I used a piece of 1-inch tubing. 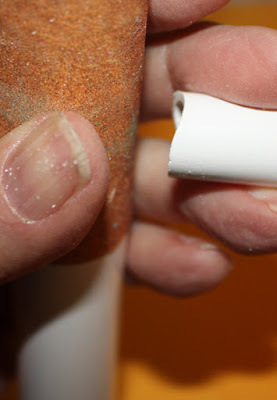 Wrapping abrasive paper around the 1-inch tube allows quick and easy grinding of the end of the Plastruct dome tubing. I usually start with 60-grit paper, and then go to 150-grit paper, as shown below. Next, I determined how high this dome would be. Since the main dome in the prototype photo above is about 22 to 24 inches high, I chose to make the subsidiary domes half that height (compare the prototype photo), or one scale foot. That height is the minimum height from the tank top. 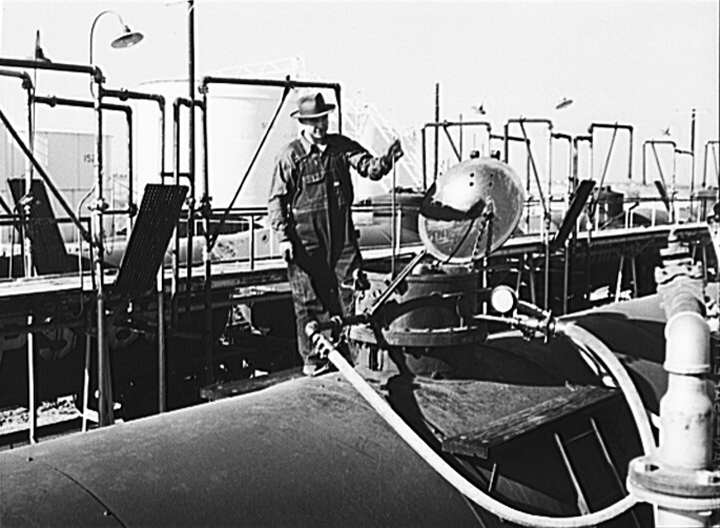 A quick calculation using the formula for a cylinder shows that such a dome would contain over 120 gallons, well in excess of the 2 percent requirement for an credible-size end compartment in a converted tank car. I made two domes 12 scale inches high. As I noted about the prototype photo of GATX 1095, the auxiliary domes have flat tops, not hemispherically-rounded tops like the main dome, and the top plate overlaps the sides. 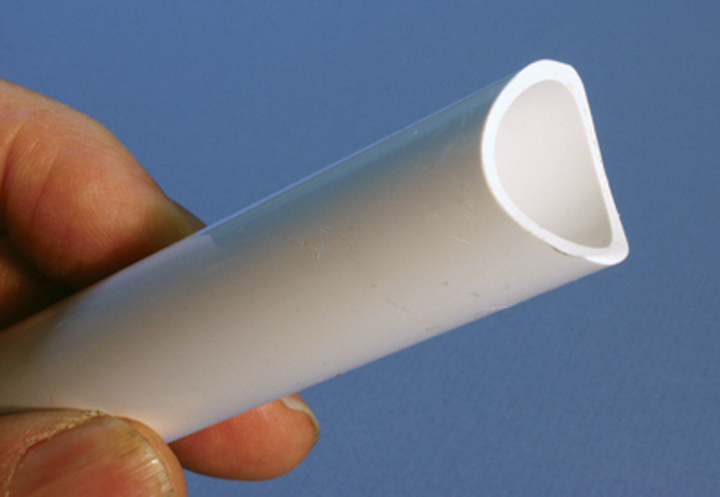 This is easily made from sheet styrene. I simply traced the end of the 5/8-inch tubing onto some 0.015-inch thick styrene sheet, cut out the disk a little oversize with scissors, and carefully used a flat file to reduce the size to the traced outline. As the material of the Plastruct tubing I used is butyrate, I cemented each segment of tubing to its styrene top with Plastruct’s “Plastic Weld” adhesive. Next I will add approved bolted manways, one source of which is the Tichy detail set, and the Owl Mountain frangible-disc safety vents (my post about these is cited above, just under the prototype photo). Then, of course, painting and lettering. But all that will all be shown in a future post. In previous posts in this series, I have discussed a wide variety of topics for both prototype and model waybills; you can readily find any of those posts by using the search term "waybills” in the search box at right. (For a summary by Mike White of the first 25 or so posts, see this link: http://modelingthesp.blogspot.com/2013/02/waybills-27-collected-posts.html .) The present post takes up one thing usually neglected in these discussions, and that is the way these were handled in practice, on the prototype. 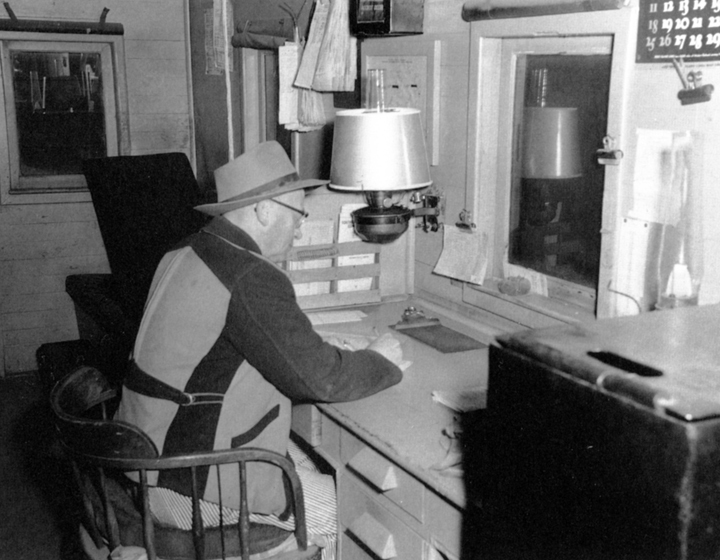 Note the wooden rack containing an employee timetable along with some folded waybills, at his left, and the several steel clips affixed to the wall, along with a calendar at upper right. The box visible on the right of the photo is the coal box for the stove (until the 1960s, SP caboose stoves burned coal). But even though the bills were handled en route by conductors, it should also be remembered that agents both originated and terminated waybill use in many cases. (In a city, freight clerks would have done the same.) 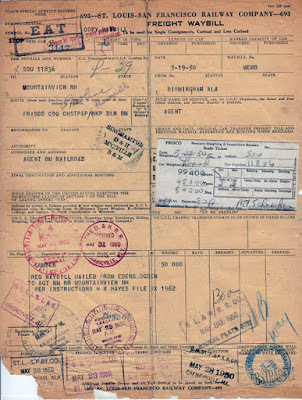 And a waybill being exchanged between trains, or arriving at destination, would of course be handled by clerks too. I really liked the clerk photo that Jerry Dziedzic included in his column, “On Operation,” in Model Railroader, in the issue for June 2016, showing clerk Bob Nowland at Keddie, California, in the Western Pacific yard office there, with a batch of waybills in his hand. With permission from Jerry, who took the photo in February 1974, and from Model Railroader (which owns the image), here is that photo. In this view you can see more paperwork, which may be additional waybills, in the pigeonholes on the wall, and a form on the desk in front of Bob, which Jerry speculated might be a switchlist based on those waybills. For those of us who like to operate model railroads in at least an approximation of what the prototype did in the era modeled on a particular layout, these period photos are superb reminders of what we are trying to accomplish. 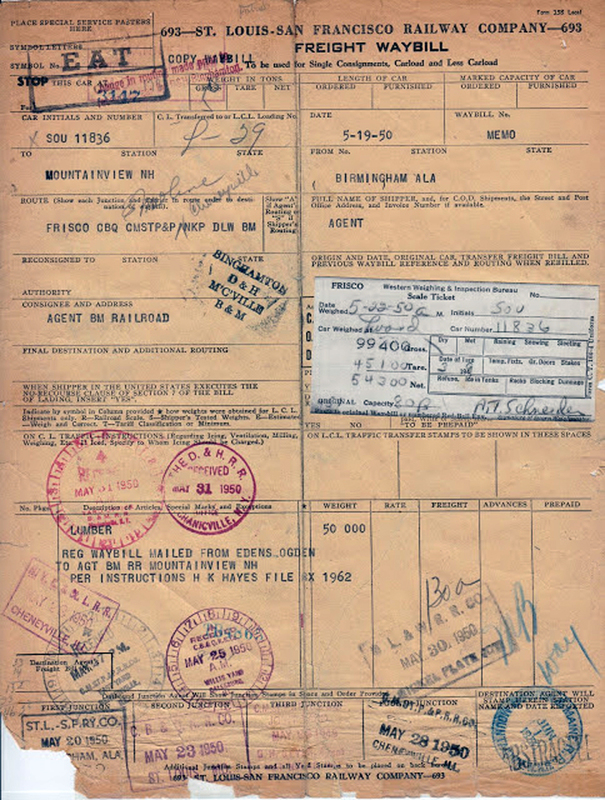 I for one continue to find waybills, like the Frisco one shown above, to be fascinating documents that encapsulate a lot about freight car operation. They are also of course a marvelous window into a brief but very specific moment in the history of a particular freight car. But even beyond that, I also want to remember all the employees that worked with those waybills, and the ways in which they did that work. 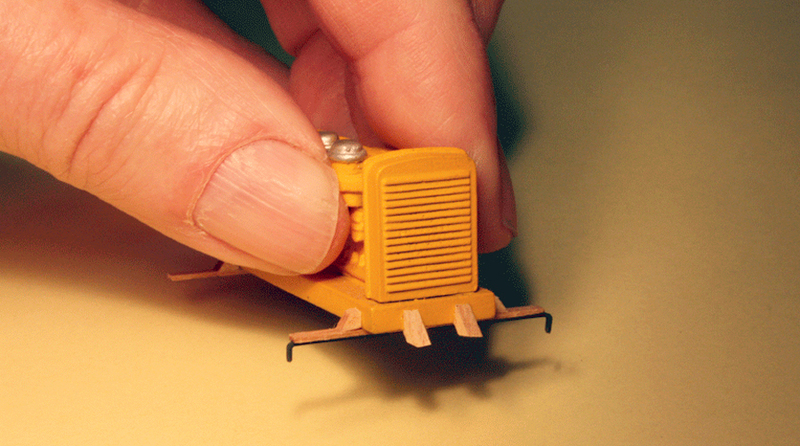 In a previous post, I showed the prototype for a model which Richard Hendrickson had begun, and which I inherited. It is intended to be a Class FE-25 double-door auto car, rebuilt from an earlier car class (for prototype photos and an introduction to the model as I received it, see that first post at: http://modelingthesp.blogspot.com/2017/01/another-hendrickson-car-project.html ). In the present post, I show more of the model as it came to me, and proceed with the project. Richard started the model with an Athearn 50-foot automobile car, because the sides have the pattern of side panels used by Santa Fe in this rebuild. The Athearn roof is wrong, having one too many panels, so it was removed and a substitute roof prepared. 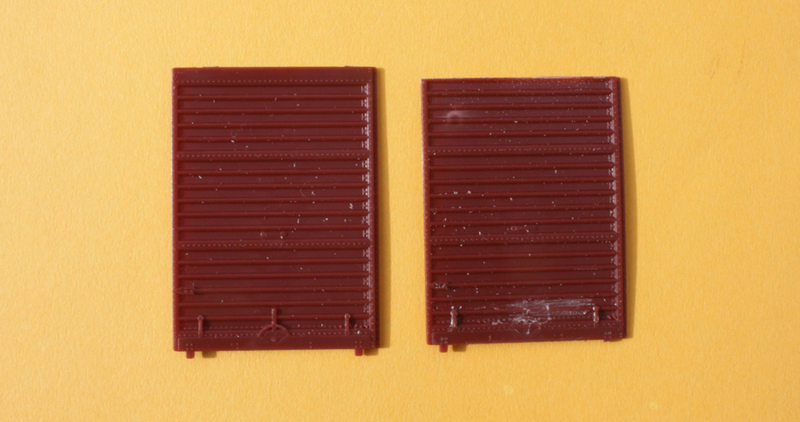 The Athearn ends are completely wrong for the Santa Fe car, so Richard removed them also and placed styrene bulkheads to fill the open ends. Below is a view inside the model, showing one of those bulkheads. 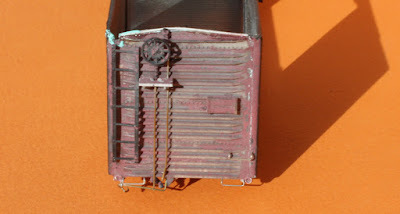 On the outside, Richard kitbashed corrugated ends to match the Santa Fe 1-7-5-5 pattern, I think from Tichy corrugated ends, though I am not sure. (Ends like this are described by counting the corrugations in each panel of the end, from the top down, thus 1-7-5-5.) Any such end has to receive also a widening strip along each side, to match the width of the rebuilt body. You can see this on the view below of the B end of the car. Richard had already placed grab irons, ladder, and brake gear. One glaring absence from the model at this point is the side doors. In fact, I suspect the reason Richard had not attached the roof was so that it would be easier to attach the doors properly before the roof was added. The door opening is a little over 14 feet on this car, so a pair of 7-foot doors is needed. I had some Branchline 7-foot Youngstown doors (their part no. 140006), now sold by Atlas as part BL 140006. This part number gets you two doors, so you have to have two sets for this double-door car. But there is a problem with these doors. They represent a post-war design with center operating levers. The prototype photos of the Santa Fe rebuild clearly show inner-corner operating levers. My solution was to carve off the center levers, as you see in this comparison of a stock door and a modified one. Note also that the door at right has been shortened to fit Richard’s model. The good news is that these 7-foot-wide doors do indeed fit the car, when shortened as just mentioned. The photo below shows a test fitting. The corner operating levers are not yet added. 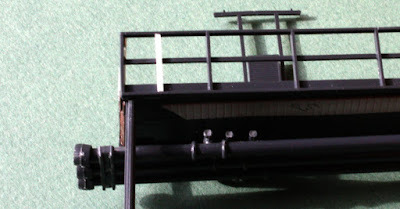 The operating levers can readily be approximated by adding styrene strip or flat brass wire, which is my next step. The style of these Youngstown doors is not an exact match to those shown on the prototype FE-25 cars in the previous post. 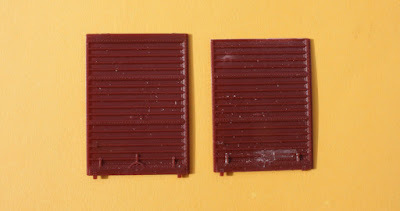 The original Athearn auto car doors are a closer style, and Richard modified those doors on another model he built of an FE-25, though the Athearn doors are a little too wide. In fact, the lack of an exactly matching door may be what caused Richard to put this project on hold. The other problem that might have stopped him on this model is that the door track is not below the car side, as it should be. This would not be an easy correction to make. He did it correctly from the beginning on his other FE-25 model, and might have decided not to complete work on the model I have. But I intend to continue with this project as best I can, because I like the prototype and I like the model components. As experienced modelers know, it can happen on many projects that eventually one has to make a compromise on some part of the build. I will proceed with attaching doors and roof in a future post, and will probably also then complete side detailing. That will leave several areas of detailing, including brake gear, still to do before painting. But I look forward to completing this project that Richard started. Regular readers of this blog will know that I am part of a cycle of writers who contribute to a column series in Model Railroad Hobbyist, a series entitled “Getting Real,” with the aim of discussing any and all aspects of prototype modeling. My latest column appears in the February 2017 issue (this issue of MRH, and any other issue, can be read or downloaded at any time, for free, at their website, which is www.mrhmag.com ). 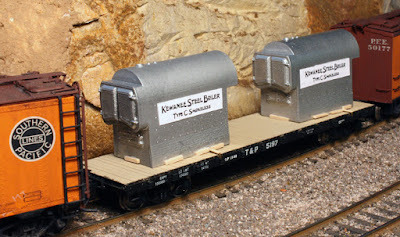 This column is about standards for model freight cars. I have touched on this topic a number of times in this blog, but have never pulled it all together and tried to include all the aspects of the standards that I use. I wanted to do just that in the column, and also provide citations of sources for more information about several parts of the story. In particular, I wanted to emphasize performance standards, since they are so vital if equipment is to be operated. And performance is not hard to ensure with today’s excellent equipment. On my second topic, which is appearance standards, at first I thought that it might not be practical to address those. After all, any of us might be satisfied with a stand-in for one particular car, while for another car we might wish to strive for the closest we can approach to museum quality and accuracy. Few of us are entirely consistent about any one point in that range, certainly not me. What I decided to do was to concentrate on minimum standards of detailing and overall appearance, by which I mean the absolute floor I want to put under the appearance of my freight car fleet. And my experience has been that once I decide on such a floor, any car falling below it is pretty soon on the workbench for an upgrade. I wanted to convey that mode of thinking. An example from personal experience was etched-metal running boards. When these first came on the market, I bought a couple and really liked how they looked. But the combination of expense and modeling time to convert my whole fleet made me decide to start by doing just a few cars, and then in future, replace old plastic versions a couple at a time, when I had time and inclination to do so. But the first converted cars looked so immensely better, that I soon gave in, and went to work converting the whole fleet. Without intending to do so, I had created a new minimum standard. For appearance generally, I decided to concentrate on painting and lettering, After some reflection, I realized I always want to weather, even an almost-new car, and I add route cards to nearly all cars. On most cars, those that are more than a couple of years past their built date as of my modeling year of 1953, I would also add reweigh and repack data, as I have often advocated and illustrated on this blog. And more recently I have been adding more and more data blocks for brake servicing (usually on the reservoir). This column was an interesting challenge for me, to boil down what I do all the time, though normally without much reflection when I’m at the workbench. In other words, these are standards that for me are well internalized. I had to think them through to assemble this month’s MRH column, which in a way was a rewarding process. I hope you enjoy reading about the result. I have occasionally had visiting modelers ask, what the heck is this? So in today’s post, I want to expand on what this business is, as well as indicate where the layout site is going. Actually, chemical repackaging is a widespread business type, found all over the United States, though not often included in model railroads. What kind of business is it? The core business is to take a bulk chemical, and package it for distribution. 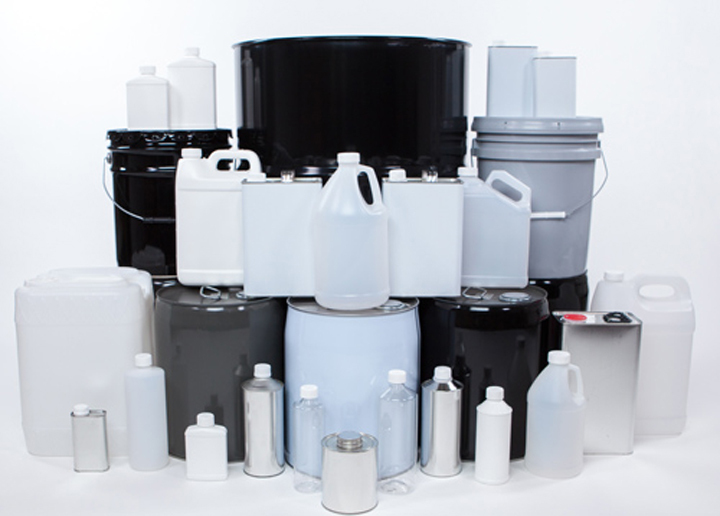 For example, a solvent might be purchased in tank car lots, and then packaged into gallon containers for sale. Some repackagers also offer manufacturing and decoration of the final containers. In addition, when a company changes its name, or its corporate appearance, there may be an old stock of products that needs to be put into new packages. Naturally the repackager is expected to be competent to handle dangerous materials, whether flammable, corrosive or otherwise noxious, in a safe manner. In addition, a repackager may work to blend, formulate or compound new materials from suitable raw materials. For example, paint thinner is sold in a variety of compositions, and a repackager should be able to make up a desired formulation and also get it packaged. Again, the raw materials may arrive in tank cars if liquid, in covered hoppers if solid, or in intermediate packages such as sacks or drums, likely in box cars. If one searches on the internet for this type of business, a great many will be found in most areas of the country. They vary widely in how large are the quantities they can handle, or if they specialize in solid or liquid materials, or in specific classes of chemicals. They vary in what kinds of containers they are equipped to fill, from cans and bottles, to jugs, pails, bags and drums, and whether they can put packages in cartons, otherwise package containers, or put them on pallets. They also vary in whether they can print, label or otherwise decorate packages. But at core, they handle putting materials into packaging. Here’s an on-line photo of typical packaging that can be accommodated. These would probably be assembled into cartons or equivalent for shipment. This seemed to me a good model industry, as it can receive tank cars as well as box cars and, if suitably equipped, covered hoppers. 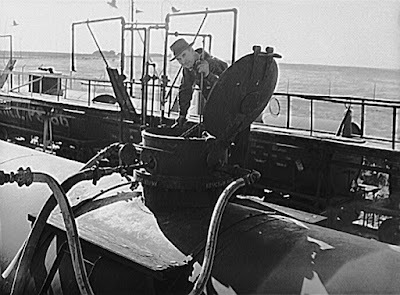 Shipping out would be mostly in box cars, though one could imagine situations in which a blended or formulated material could be shipped out in tank-car lots. Such a business could have a range of sizes of buildings (many do not have particularly large buildings), but could well have a lot of tankage, perhaps multiple tanks of the same size or, equally likely, a motley collection of sizes and shapes of tanks for handling all kinds of quantities. If one likes modeling piping, this would be a great opportunity for lots of exposed piping. 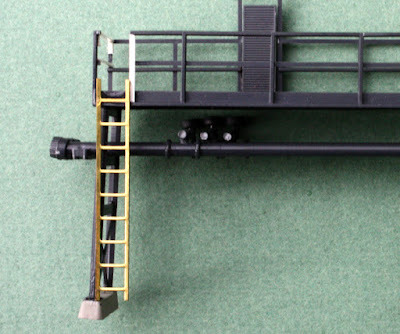 (As one example of a starting point, Walthers offers a Refinery Piping kit.) On-line photos of repackaging companies, however, show many with the material storage inside the building(s). My choice is to install a moderate number of tanks. The business of this type on my layout now needs to be made more complete. As the photo above shows, I call it “Pacific Chemical Repackaging,” and it has operated for awhile with only the dummy building seen in the photo, and a few storage tanks alongside. Now I want to install a proper building for this industry, and organize the tanks. 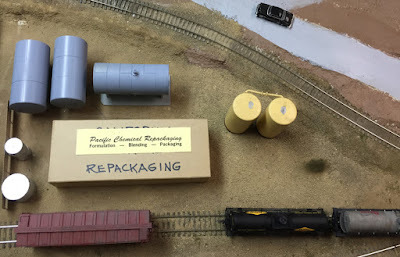 I searched through my stash of structure kits, and in particular tried to assess what might fit into the space on my layout, leaving plenty of space for storage tanks, of course. I chose an old kit from Design Preservation, their kit 103, called “Cutting’s Scissor Co.” It has the disadvantage that it is a brick building, not the most common building type in California, but if painted to represent a brick color other than brick red, it would be less distinctive. Part of this structure is two-story in height, and I know from experience that it is helpful to provide some kind of interior view block between floors. Accordingly, my first step was to glue some styrene strip horizontally inside the building, to support a floor. I used Evergreen 1/8-inch square stock. The clamps here are reversed clothes pins, a favorite tool of mine for almost-parallel clamping. Once that floor support is installed, I went ahead and assembled the building. Before installation of roof pieces and painting, I wanted to judge how well it fit my layout site, and how much room there would be for additional tanks or auxiliary structures, along with a possible access road. Here is a photo of one arrangement. This industry is an interesting one, and because it is a destination for chemical tank cars, which I happen to like, it’s a nice addition to my layout. I will show completion of it in a future post or posts. I have mentioned in a previous post a technique I use for some loads which are for flat cars. This is just to locate the loads securely on the deck. 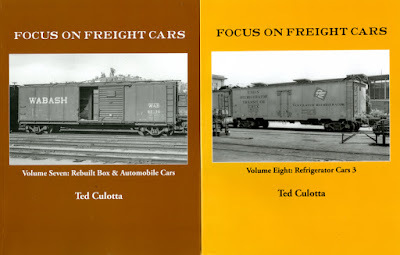 (You can read it at: http://modelingthesp.blogspot.com/2012/03/open-car-loads-crates-and-machinery.html .) The “locator bar” or load-holder bar is simply a strip of flat brass bar stock, bent to just span the car deck, and painted to conceal it. If the bar extends into a stake pocket, I usually paint it black (an old theatrical technique, which recognizes that things painted black tend to be invisible). If the bar extends down over the car side, I will usually paint the ends boxcar red, to blend into any flat car of that color. To illustrate this locator bar as I did in that original post, here is a repeat of one of the photos used there. In this case, the brass strip is attached to a diesel engine load. End blocking is present too. When in place on a flat car, this bar is all but invisible. One drawback to this method is that the turned-down ends of the brass strip are intended to fit into stake pockets on the flat car. 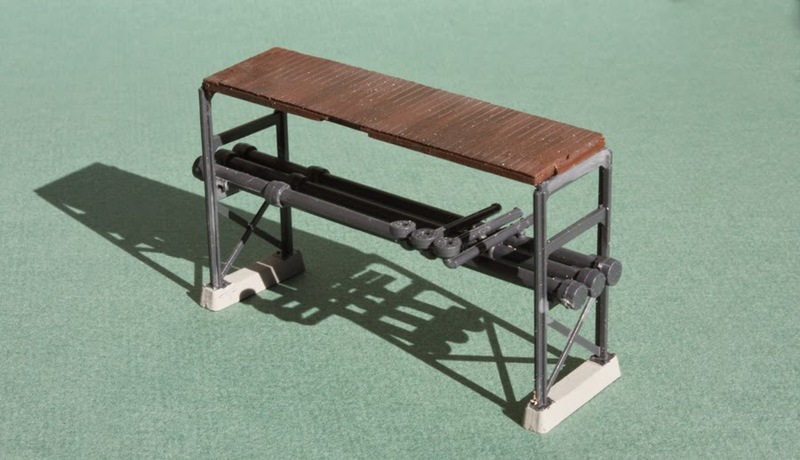 But not all model flat cars are the same width over the pockets, so to some extend one has to choose which make of model flat car will accept any particular load. For example, the Tichy 40-foot flat car is exactly 9 scale feet over inside pocket surfaces, while the Proto2000 (now Walthers) car is 9 feet, 1 inch. The Red Caboose SP flat car, and the Athearn cars, are 9 feet, 3 inches, and the WestRail flat car, of a slightly different design, is 9 feet 8 inches. What this means is that a load with any particular length of locator bar will not work for all flat cars. I write on the bottom of the load, which model manufacturers’ cars it fits. My current project for a load securement like this is the Kewanee boilers sold by Resin Car Works (this is their Load 01, which can be seen on their web page at: http://www.resincarworks.com/scene.htm ). They are sold as a pair, but of course one can handle and load them independently, so one could have two cars with one boiler each, or a single car with two boilers. My thought was to add a locator bar to each boiler, plus wood blocking to conceal the locator bar (as in the above photo). First, I added a “floor” piece inside the boiler, then notched the sides and glued down a piece of flat brass wire in the notches. In this case, I used the width of the Proto2000 deck, as noted on the underside. This view looks directly down on the locator bar, so the “prongs” that go into the stake pockets are only visible on end. 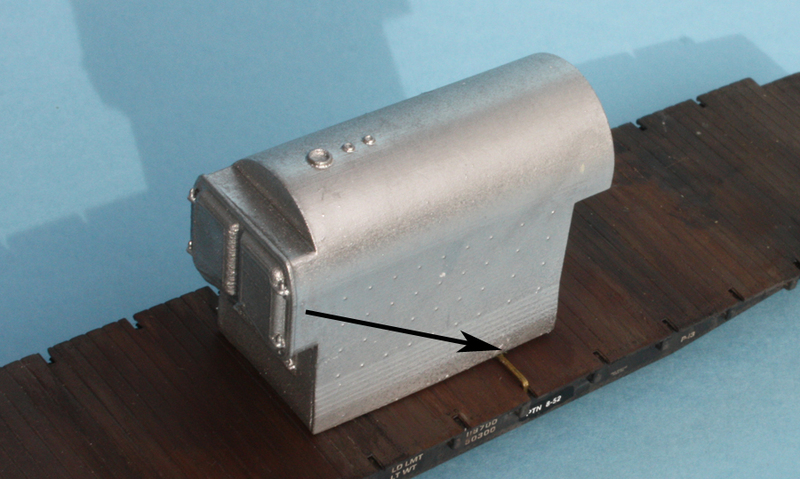 When this locator bar is put into use, the boiler sits properly on the flat car deck. 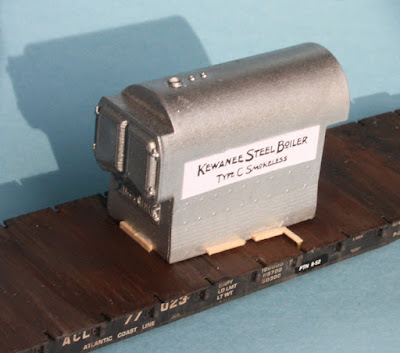 Shown below is one of the boilers on a flat car, so far without the blocking or any signs. I have indicated the locator bar with the black arrow. Even if left bare, as you see here, it is not obvious, and a coat of black paint would certainly make it fairly hard to see. I added some blocking with scale 4 x 4-inch stripwood, and a piece of 1 x 4 atop the locator bar. A graphic for the Kewanee brand is included in the kit instructions, so I scanned that and printed it out in a size that fits on the boiler model. The kit also includes hold-down straps, which I may add also. Here are both boilers on a 40-foot Tichy flat car, positioned over the trucks as in the prototype photo included on the Resin Car Works site about these loads. The flat car has yet to be weathered. I have used this technique of securing loads for some time now, and still find it effective in putting loads onto flat cars and having them stay where I want them. It’s easy to do. If you have any loads that don’t stay where you want on flat cars, you might try this solution.